Date: Sunday 6th December 2015. Activities: Bouldering and eating – we will also set up a slackline or two. 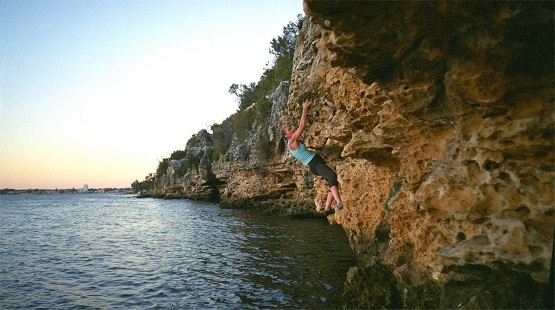 Time: 4.30 onwards for bouldering at Blackwall Reach. BBQ provided from 6.30pm. Following the BBQ, those keen can head into Freo to continue the evening. Directions: Come down Honour Rd on the left side of Pt Walter Reserve, going straight through the roundabout at Carroll Drive and continuing on past the tennis courts. On your right you will see a kid’s playground, some parking and BBQ’s that are quite close to the road. We will be in that general area, fairly close to the road. On your left, if you follow the path down to the water, you will find a long expanse of limestone wall conveniently placed for your bouldering pleasure. RSVP: Essential for catering purposes. Please let us know by Tuesday 1st December 2015 via email to megans@climberswa.asn.au. If you have specific dietary requirements (e.g. vegetarian) please tell us. Guide books and CAWA t-shirts will also be available for sale on the day, please bring correct change – $25.00.